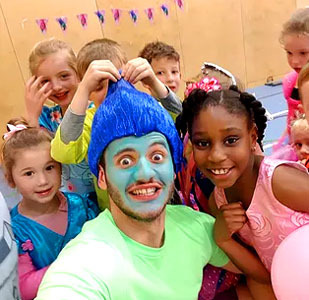 Krazy Kris has worked as a professional children's entertainer for over eight years and he's extremely energetic, enthusiastic and eager to give every party he does one hundred per cent. 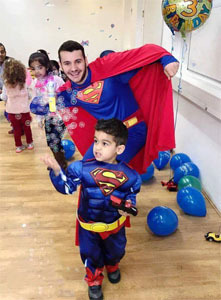 His fun fuelled entertainment includes thousands of bubbles, amazing magic (the magic includes the birthday boy or girl), balloon modelling, parachute games, disco dancing (oh yeah! ), sparkly glitter tattoos, prize giveaways (all supplied) and tons and tons of party fun. 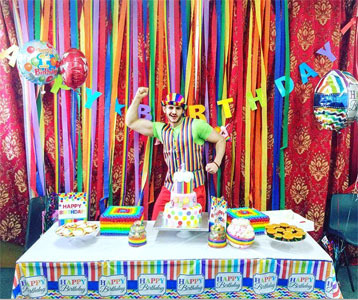 Kris is ace at theming a party, from being a clown to a pirate to Jedi knight to your favourite superhero. Kris loves to colour a children's party with happiness and smiles and it's his aim to leave tall the children - and their mums - talking in the playground about it for weeks after!